Back in June of 2012, I wrote that the Placeholder Attribute Is Not A Label. The post points out that it’s bad practice to use text to look and behave as a placeholder rather than a label. This is generally known as “floating labels” or “inline labels” (I also call this LAP for short, “labels as placeholders”.) And as you may know, labels are required for accessibility (and usability) as they identify to the user what the input is for. It’s a general best practice to provide a label for every form input. Unfortunately this design trend still continues even despite repeated concerns on use of placeholder from web development and accessibility experts. Web Axe too maintains that this pattern is bad for a variety of reasons which weren’t fully listed in the original post. Whatever the reason floated labels exist, here is a list of potential issues with the pattern. The simple fact that since the label disappears when entering text, the user may forget what the input is for. This is especially important when reviewing form data; for users with a cognitive accessibility; and people who may be distracted when completing a form. This pattern can’t support both a label and a placeholder. Depending on user’s environment and implementation, there may be a delay in rendering/performance: on page load and in text disappearing after beginning typing. Or even it breaking entirely; see the two examples below. 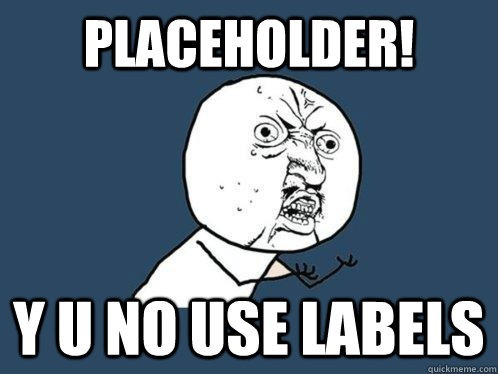 If an HTML5 placeholder is used for label, older browsers and/or assistive technologies may not support it at all. For example, there is no placeholder support in IE9 and Opera Mini. Placeholder text is rendered differently across browsers/versions; extra design and development is required to make them accessible (color contrast is usually very low) and have consistent styling. The traditional label is straight-forward and reliable. Developing this pattern in the best way possible can be fairly complicated and is inconsistent among implementations. Code becomes heavier, more fragile, and more difficult to maintain. The pattern doesn’t support standards; it doesn’t implement HTML elements and attributes as intended. The W3C HTML5 placeholder specification specifically states it should be a “short hint” of user input and states: The placeholder attribute should not be used as an alternative to a label. No matter how many issues exist, the fact is that the floated label pattern is prominent on the web. Here are a couple of unique examples of this pattern in the wild which have completely gone wrong. This demonstrates only one of many issues with this pattern; sometimes the label doesn’t disappear visually and the label is blocking the view of the input text. 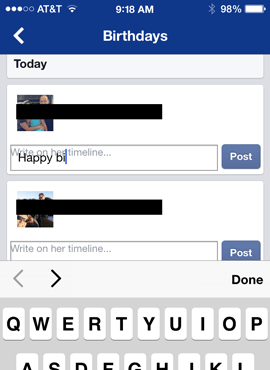 Facebook birthday fail in iOS app. Attempts have been made to help address or fix this problem, but not with much traction. One idea is to ask browsers to darken the placeholder text so that it passes WCAG color contrast requirement. This is a plausible suggestion but not likely to happen, especially any time soon. See below for the CSS fix. And doing so only addresses one issues; it wouldn’t fix the fundamental problem of the label disappearing. Another attempt is to, upon focus of the input, reduce the text size of the floated label and move it to the bottom of the input field (rather than it disappearing entirely). This is not a feasible solution either as this behavior may cause confusion, requires text size that’s too small, and still adds code weight. Besides, if the label is going to remain visible near the input, it should just be there in the first place. The label element represents a caption in a user interface. It tells the user what the purpose of the input. The placeholder attribute represents a short hint (a word or short phrase) intended to aid the user with data entry when the control has no value. 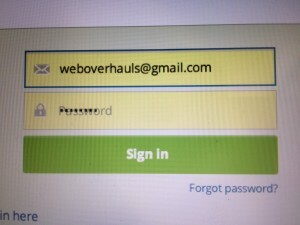 In the example below, the label “Enter URL” clearly indicates what the text input is for. The placeholder “http://” is a short hint as to what text should be entered. Also, a good guideline for placeholder text is similar to title attributes: only use them for supplementary information, not required information. Example of recommended use of input label and placeholder. An exception to always displaying a visible label may be the search input where an icon (such as a magnifying glass) and the location of the form on the page visually denotes it’s meaning sufficiently. A visually hidden label is still required. To better support mobile devices and screen enlarging tools, place the label above the input (as opposed to the left). Please don’t use “floated labels” or “labels as placeholders” technique; it can break the user experience for a large variety of reasons. Use the label element and placeholder attribute as intended. Use CSS to ensure placeholder text has adequate color contrast. HTML5 Accessibility Chops: the placeholder attribute by Steve Faulkner. 3 Types of False Simplicity by Christian Holst. Don’t Put Labels Inside Text Boxes (Unless You’re Luke W) by UX Matters. Mobile Form Usability: Never Use Inline Labels by Baymard Institute. Added: Placeholders are problematic by Adam Silver. Added: Accessible floating labels by Matt Smith. Added: Accessible CSS-Only Floating Labels by Pablo Martinez. Please don’t use “floated labels” or “labels as placeholders” technique; it can break the user experience for a large variety of reasons. This agrees with the observations we have made in many usability tests. However, I disagree with your recommendation to use the ‘placeholder’ attributes for hints. I agree that ‘placeholder’ is intended to be used for hints. Unfortunately, it’s not a good idea. I also have many hours of video of people who fail to understand what the hint is, who try to edit out the hint, or mistakenly try to accept the hint as a default entry. Caroline, if label and placeholder were implemented correctly (according to the W3C spec and my blog) and consistently, users wouldn’t be confused by the hint. Label misuse is also problematic for voice control; see article Considerations for Testing with Speech Recognition Software such as Dragon Naturally Speaking. When controls do not have visual text labels users of speech recognition may not know what text to voice to directly activate the control. A bit better but I still don’t advocate. If the label remains shown when focused, then why stray from the traditional design? This pattern also breaks basic rules/needs: 1. the placeholder attribute is used incorrectly, and there’s no way to support a label and correctly implemented placeholder (see this post’s content above for details) 2. May be confusing or distracting to users with a cognitive disability; 3. By default, browsers render placeholder text with insufficient color contrast by default in browsers so this must always be patched (which is hardly ever done). 4. When label appears at bottom, the text is too small.